GFAR through their electronic website and portal known as E-GFAR has been supporting the promotion of the KS project by adding information on and links to the project in various places on its website. “GFAR is a multi-stakeholder initiative that contributes to eradicating poverty, achieving food security, and conserving and managing natural resources. It enhances national capacities to generate, adapt and transfer knowledge. The CGIAR is a stakeholder in GFAR. 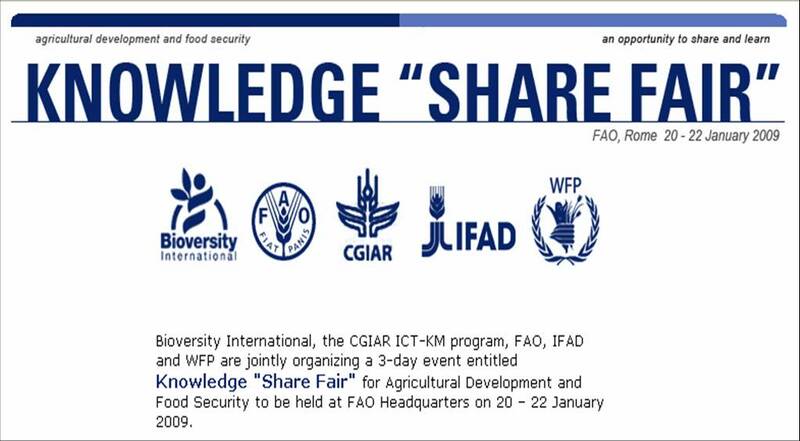 In keeping with their mission to develop an electronic platform to which stakeholders can contribute to the content, GFAR has supported the CGIAR ICT-KM program’s Knowledge Sharing project in promoting itself through this valuable mechanism. The Young Professionals’ Platform for Agricultural Research for Development (YPARD) recently closed the call for sponsoring three young professionals to participate in the upcoming FAO-CGIAR Knowledge Sharing Workshop, a three-phased event that combines online and face-to-face interaction. We congratulate the winners and look forward to a successful workshop! The Global Forum on Agricultural Research has released two important documents on Information and Communication Management for Agricultural Research for Development. This document represents a collaborative effort by the GFAR Secretariat and the Regional Forums to agree on a common policy for advocacy on ICM. The document details what and how the Regional Forums should advocate and what the role of the GFAR Secretariat should be. This document describes the idea of a “web ring” of ARD web spaces and proposes an approach based on a distributed architecture. 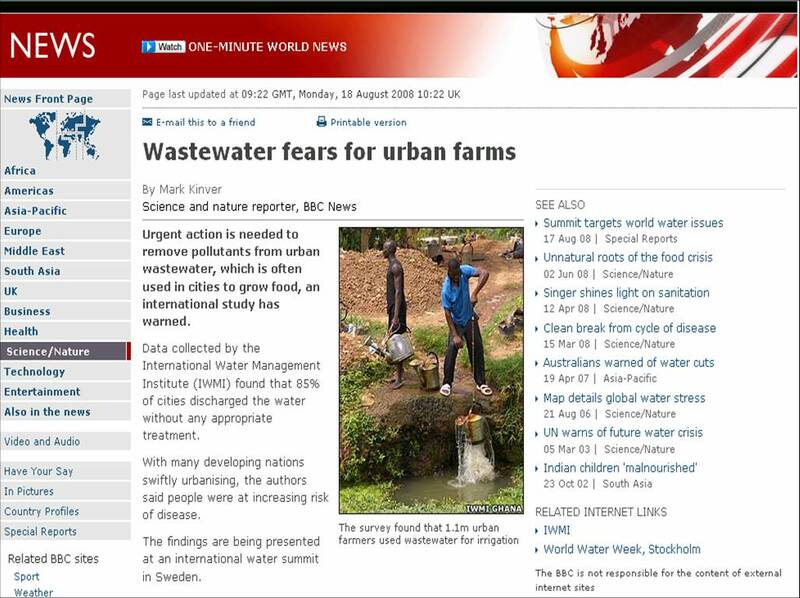 The Global ARD Web Ring is a “voluntary coalition of web spaces that share information related to agricultural research and innovation for development.” These web spaces make ARD related information sources more accessible through each other. The UN Food and Agriculture Organization (FAO) will facilitate an e-Agriculture panel to deliberate issues of ICT as enablers in various critical areas of development, as well as the role of Public Private Partnerships (PPP) in support of e-Agriculture. and Stephen Rudgard, FAO, as the moderator. The panelists will share knowledge and experiences, and the audience encouraged to contribute on topics such as the use of mobile telephony use in rural areas, with particular reference to ameliorate global soaring food prices, and knowledge brokering services in support of agricultural development, including Communities of Practice and approaches to building capacity. There will also be a reprise of the issues arising in this year’s PPP online forum and eIndia conference discussion session entitled “Making e-Agriculture Work through Public Private Partnership in Asia”. Experience and lessons in Bangladesh (Katalyst) and West Africa (Tradenet) will be contributed. Full details of the PPP online forum, and reviews of the two sessions organized by FAO, the Global Knowledge Partnership (GKP), OneWorld South Asia and Katalyst in the e-Agriculture track of India’s largest ICT Event, eIndia 2008 in July 2008, can be found on http://www.e-agriculture.org. A key assumption underlying this issue’s rationale is that mutual learning between Northern and Southern stakeholders is an important success factor, not only for knowledge strategies, but also for development processes overall. Therefore strategies aimed at facilitating mutual learning need to be woven into the very fabric of the development organisation. However, it is not clear how knowledge strategies have so far contributed to mutual learning and, if they have, what indicators they have used to account for this. This issue of the journal aims to showcase studies of knowledge management for development strategies, and how these facilitate and catalyse reciprocal learning among different types of development organisations — NGOs, bilateral and multilateral organisations, community-based organisations, etc — in different locations, both North and South. The submission deadline for the title and abstract is 15 September 2008.